Please note: for a limited time, I'm offering unlimited, never-expiring access to my full programs for the SAT and ACT for only $497. Join Now! How much do you want to raise them? How do you want to go about doing it? There are countless ways to prep for these tests. They are not created equal. 1. If you’re not raising kid's scores by entire college tiers, prepping isn’t even worth either of your time. Unless you’re raising your child's scores by at least 3 points on the ACT or 100+ points on the SAT, you’re not even moving the college admissions needle. 2. If you're required to "manage" your child's prep, you're wasting your time on an ineffective program. Effective prep can, should, and must empower your kid to study on his or her own, without parental involvement. Otherwise, you're setting your child up for failure. A recent Wall Street Journal piece revealed that most programs improve scores by an average of ~20 points on the SAT, and less than 1 point on the ACT. For such tiny numbers, that’s a big problem. huge score improvements with complete flexibility. Helping students score higher on standardized tests is literally my life’s work. It’s the only job I’ve had since my first semester at college in 2005. 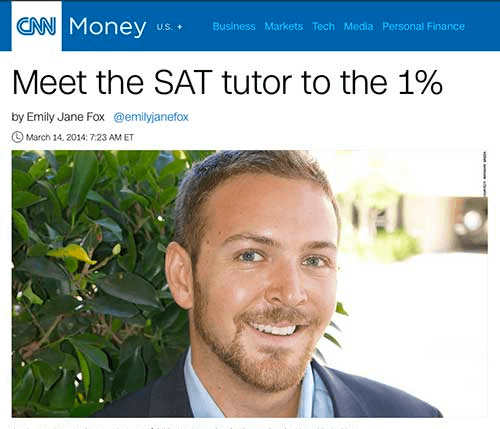 After breezing into Columbia University (not too hard when you have 99th percentile scores), I got a job tutoring at one of the big prep firms to pass my success forward. I was inspired by my own tutor, who took me from a 40th percentile PSAT score to a 99th percentile SAT score. But when I started working at one of the “big names” in the prep world, I was beyond shocked! The tutors were unqualified, the students were unmotivated to learn, the methods were one-size-fits-all and no one was getting any better. Most of the coaching and tutoring services out there still deliver terrible results. But because I improved my own SAT scores by so many points, I knew there had to be a better way. Since then, I’ve developed a 4-year waiting list for my one-on-one services - at $1,500/hour. Mostly through word of mouth. Not to toot my own horn, but I’m doing something right. Thanks to the results I bring to my clients, I’ve been featured everywhere from The New York Times to Good Morning America. You’ll need to wait years to work with me one-on-one, but you don’t need to wait to experience my results. I’ve converted all my knowledge - my best study methods, lessons, and techniques - into an online prep program that anyone, anywhere in the world can use to amplify their scores. These are the same strategies, the same lesson plans, and the same methods that I charge my clients $1,500/hour to learn - in an online program you can use at your own pace and on your own schedule. 1 My full SAT & ACT curriculum, including all my best strategies, and tools. The exact steps you need to take, from day one through test day, to rapidly improve your scores. Learn what you need to study, when, and how, in order to raise your scores by entire college tiers. Take the guesswork out of the process – just log in, pick up where you left off, and watch your scores skyrocket. The most effective strategies, tactics, and tricks for all sections of both tests. Get the simplest, most effective approaches and tools for all sections of both tests (including the essays), along with comprehensive lessons on how to use them. Unlimited, 24/7 access from any device – for as long as you need it. Log in from any browser, tablet, or phone wherever and whenever you have the time. Get unlimited access to the SAT & ACT programs for one price, with no schedules to keep and no limits to your access and score improvements. Full practice testing schedule using real SATs and ACTs so that you know what you’re scoring, how quickly you’re progressing, and have all the testing experience you need when you take the real thing on test day. Holistic prep that keeps the real world in mind. Set goals, create a prep schedule, and build effective prep into your daily routine. When you know where you are, where you need to go, and precisely how to get there, test prep doesn’t need to be a burden. Review methods designed with the SAT & ACT in mind. Leverage your study time and rapidly improve your performance with the most effective, test-specific review routines ever built. 2 Customizable Training Calendars and Complete Training Flexibility. Set a target date to take your SAT or ACT and learn how to customize the program to meet your needs, match your schedule, and exceed your goals. Submit score improvements and progress on a weekly basis - parents, students, and our team review reports to keep everyone on the same page and on track toward hitting your goals. Receive optimized test-day prep - learn exactly how to study in the weeks, days, and hours before your test, optimizing your body, mind, and psychology for perfect performance. Keep your skills fresh with a customizable maintenance plan between the time that you take your test and the time you receive your scores. 3 College Strategy Secrets, My A-Z College Coaching Program. My entire online program with everything you need to get into the college of your dreams. Unlimited access to my videos, workbooks, transcripts, and more - like a $50,000 college consultant in a neat, online package. Learn to select the right college for you - the one you want to go to most, and that wants you to attend. Half the admissions game is picking the right school - learn how to do it right. Leverage your GPA and test scores for easier admission. Learn what GPA and test scores colleges want, and how to get them (and because you’re a member, your SAT/ACT scores are already taken care of). Optimize your extracurriculars for amplified chances of admission. Learn what colleges want, what they don’t want, and how to get the most out of your time. Craft a perfect application, from your essay to your recommendations, taking advantage of every loophole and using the tricks I’ve discovered after working with over 500 of the most elite applicants in the world. Does your program work for PSAT prep? Absolutely. The PSAT is just a shorter, slightly easier version of the SAT without the essay. It tests precisely the same material, the format is nearly identical, and the difficulty level is almost exactly the same. Also, if you are seeking to position yourself to be a National Merit Finalist, Green Test Prep students that complete the program crush the unprepared competition! We have loads of happy GTP alumni who became National Merit Semi-Finalists and Finalists, in addition to posting huge SAT scores! You should kill two birds with one stone: by prepping for the SAT, you’ll get a higher PSAT score than you would by studying for the PSAT (imagine prepping for a 5K by training for a 10k race), and you’ll be ready to take the SAT immediately thereafter. Don’t treat these tests as two different entities – they’re essentially the same thing. What kinds of score improvements can I expect? That depends on how many points you need and how much time you put into the program. My average student improves by over 215 points on the New SAT and 4.6 points on the ACT, but everyone is different. Some students use the program to move from a 32 to a 34 – others use it to improve from a 950 to a 1500. My program shows you how to identify and systematically eliminate your weaknesses until you don’t have any left. If you’re starting with few, you’ll reach your goals in a few weeks. If you’re starting with many, it might take you six months. Just keep following the program until you get the scores you want - you’ll have access to instruction until you get the scores you need, guaranteed. As long as it takes to get the scores you want. Some students use my program for a few weeks, while others use it for nearly a year. It depends on where you’re starting and how far you need to go. When you start my program, you’ll learn how to diagnose your current scores and set inspiring, realistic goals based on your timeline. We guarantee your access until you get the scores you’re looking for. If you need 50 extra points on the SAT, it might take you a week. If you need 10 extra points on the ACT, it might take 9 months. Every student is different, but one fact never changes: if you put in consistent work on the right things, in the right way, you’ll always improve. Think of my program as a gym – you never “finish working out” – instead, you use the gym as often as you need to in order to attain the level of fitness you desire. Similarly, my program can be used for as little or as long as you’d like in order to attain your desired level of score improvement. Does your program cover the math, reading, essay, writing+language, English, science sections? Yes. Your purchase comes with unlimited access to my complete SAT & ACT programs, which cover all sections of both tests. You’ll spend the most time where you’re weakest. As your scores start to improve in your weakest sections, you’ll learn how to spread your time and attention to the other sections of your chosen test as well. How much work does your program take? That depends on where you’re starting, where you want to go, and how long you give yourself to improve. Some freshmen use this program for 15 minutes a day, 5 days a week, and achieve 350+ point improvements after 10 months. Some juniors put in an hour a day and achieve the same improvements in a few months. This program is built to never disrupt your schedule. Log in, pick up where you left off, and do as much as you can on any given day. There are no set timelines, so it all depends on how much you can do in a day and by how much you want to improve. What’s included with your program? ***Note: You’ll need to purchase roughly ~$60 worth of third-party texts (including the official College Board/ACT study guides) separately from the program in order to use the lessons within. You can find a complete list of all the books needed to use the Green Test Prep program here. Can I use your program on my Mac / PC / Phone / Tablet? Yes. The entire program is browser-based. You can log in any time, anywhere, from any internet-connected device. When you sign up for Green Test Prep, you’ll enter your initial scores, your goal scores, and a target date on which you’d like to take your official SAT or ACT. I’ll show you how to customize the program to improve your scores as rapidly as possible between your starting date and your target date. If you hit your score target on your target date - hurrah! Most students do! However, if you fall short of your target, or if you want to set your sights even higher, we'll keep your account open and provide continual instruction until you get the scores you need. Anthony designed this program for top students that work hard until they achieve their desired scores, so we don’t offer a refund option. Instead, we will continue to provide instruction until you achieve your goals. - guaranteed. What does your College Strategy Secrets program include? The SAT and ACT are only part of the college game. I want to make sure you have all your bases covered, which is why I include this complete program to all members at no extra cost. When should I start using your program? As soon as possible. If you start your freshman or sophomore year, you can put in ~20 minutes a day and get incredible scores before any of your friends even begin their prep. If you start late, you’re giving yourself an artificial deadline and added stress for no reason. The sooner you start, the easier this process becomes. When should I take my test? I usually recommend ~3 months to prep, but it all depends on where you’re starting and where you want to go. When you start my program, you’ll set a target deadline for your test date. Depending on how quickly you’re progressing, you can always shift that date backwards or forwards. In general, expect to gain ~80 points on the New SAT and ~1.5 points on the ACT for every month of dedicated study. Some students progress faster, some take more time, but this is a solid guideline by which to judge your timeline. Does your program include practice tests? The more full-length, timed, graded, realistic practice tests you take, the better you’ll do on test day. My program uses real SAT & ACT exams, directly from the makers of these tests, to diagnose your scores and build your test-taking skills. I teach you how to prepare for, take, review, and analyze these tests for maximized score gains. Students who complete the entire Green Test Prep curriculum take a minimum of 6 full-length practice tests. How do I know when I’m ready to take my official test? When your practice test results match or exceed your target scores. When you take realistic practice tests the way that I teach you to within my program, you’ll know precisely where you stand. If you’re aiming for a 1400+ on the SAT and you get a 1390 and a 1440 on two sequential practice tests, you should sign up for the real thing and knock it out. If you get an 1190 and a 1220, keep studying. There’s no mystery to these tests once you start studying consistently. It’s simple to figure out where you stand, and my program will show you how. Does your program include answer explanations? My program teaches you something much more important: how to find answer explanations and use them to leverage your study time. Students who rely on their tutors, teachers, and classes to provide explanations turn into impotent, dependent learners. Instead, my program shows students precisely what to do when they get wrong answers: use answer explanations in the back of their study texts, dissect them, research them further via free online tools, and turn their wrong answers into powerful, reviewable learning opportunities. My program isn’t effective because it teaches students the triangle area formula – it’s effective because it shows students how to find the formula on their own and review it until it’s a permanent, useful part of their skillset. Does your program teach timing strategies? A huge portion of our system’s curriculum is devoted purely to timing-based exercises. To get great SAT and ACT scores, you need A) the skills to answer each question, and B) the ability to apply those skills in the time allotted. Therefore, a huge portion of my system’s curriculum is devoted purely to timing-based exercises. At first, I show you how to answer the problems, adapt to the formatting of the test, etc. – then, you into “application mode.” From there, almost all the exercises have to do with timed application, speed drills, and the strategies necessary to both enhance speed at a base level and review old practice tests and questions for opportunities to enhance speed even further. Students will also take multiple full-length diagnostic tests from the College Board and ACT books and both of the Green SAT and Green ACT Systems give them simple step-by-step guidance on how to take these tests to maximize speed and test-taking skills. Does your program teach the essay section(s)? How? Green Test Prep teaches students a system for writing the essay which makes the entire grading process objective. The essay can’t be graded subjectively – otherwise, graders’ opinions would get in the way of their judgement. Instead, students start with perfect scores, and they lose points for objective errors – namely, lack of thesis, lack of topic sentences, lack of a thread, lack of relevant evidence, lack of an intro or conclusion, etc. My program teaches students a template and step-by-step process that churns out flawless essays which contain all the right elements in the right order. Students using my program learn how to structure, plan, and repeat that process no matter what the essay prompt happens to be. There’s no grader who actively gives students their essay grades within the Green Test Prep program, but by the time they learn how to “beat” the SAT and ACT essays, they won’t need one. Green Test Prep students are the best prepared test takers in this area, due to the proprietary formula that I’ve created to help my clients knock out this portion of both tests. Should I use your program with a tutor / other instruction? No. My program provides everything you need to get world-class SAT and ACT scores on your schedule. However, if you'd like tutors in other subjects (SAT Subject Tests, AP exams, academic work), you’ll have access to my private tutoring network, including discounted rates and preferential scheduling. Can more than one student use the same account at the same time? We love welcoming families on board with more than one college bound student! However, Green Test Prep only offers one user license per purchase. Therefore, every child in your home will need to acquire his or her own account. Each user has a customized workflow and target dates that will be interrupted by additional users and ruin the experience of the program. Can younger siblings use your program when older siblings are finished with it? We love welcoming families on board with more than one college bound student! However, Green Test Prep only offers one user license per purchase. When your younger child is ready for test prep, he or she will need to acquire his or her own account.